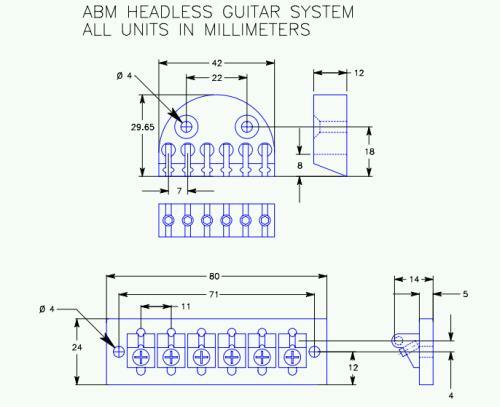 With a completed electric guitar build behind him, Romano Zambon purchased an ABM headless bridge for a future project. Finding little detail available on this bridge system, Romano decided to do some documentation and share both his observations and the plan drawing he drew up. Note: Romano indicated that the drawing was fairly accurate but warned against expecting total accuracy. 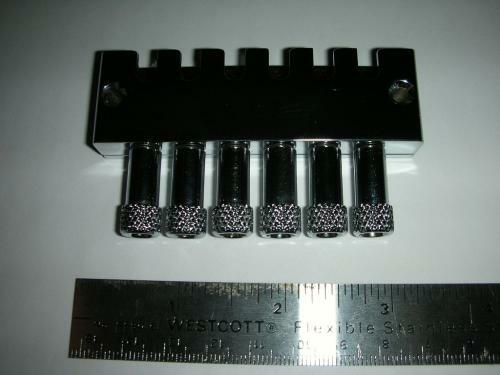 The bridge & tuner seem to only be held down with 2 #6 screws about 1″ long (possibly M4 wood screws). I will most likely use longer stainless screws since they seem a little flimsy. It appears that they just screw right on top of the body without any routing – certainly makes life easier. One nice feature Romano documents is the ABM headpiece’s support for conventional guitar strings and double ball end strings. The headpiece is mounted with 2 #8 (or M6) wood screws. There is an individual allen screw for each string so double ball end strings are NOT required. 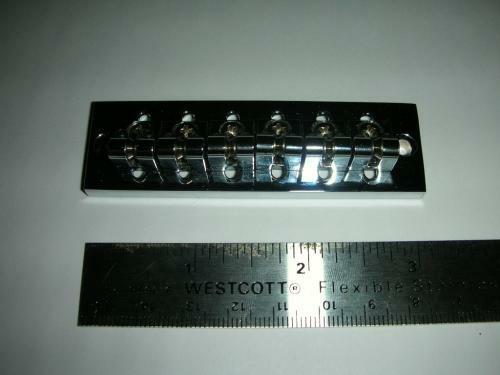 Using this headpiece would still require you to use a nut or zero fret. If you wanted to use the head piece with an off the shelf neck it may be a little tricky but not impossible. 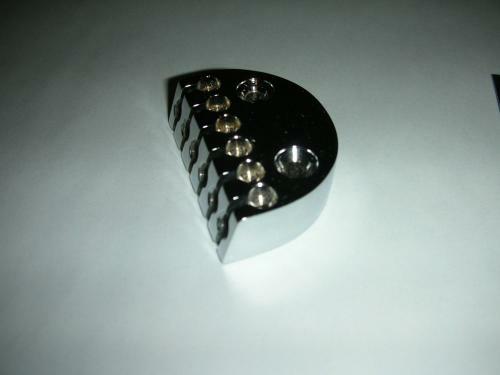 An alternative may be to use a Floyd Rose style locking nut with a mini headstock. It would certainly be easier to fabricate. Note: See the Redwood Top Forshage Guitar Revisited for an example of the mini headstock and ABM headless bridge system in action. As with the release of Romano Zambon’s Electric Guitar Plan, it’s his hope that these drawings are helpful to the guitar building community. Hey Romano, thanks! This is exactly the type of information a do-it-yourself guitar builder needs to help make design decisions. Thanks Romano for the ABM headless units plan! Very helpful! I’ve ordered one at ABM’s but they’re not too detailed with regard to installation instructions. A Question about the headpiece: is it mounted 90′ tilted backwards or just ” as you see it” ? As far as I can tell it should be mounted 90′ degrees tilted backward. However be careful, If you plan on purchasing a neck with a “paddle” headstock (the paddles are typically about 1/2″ ~ 13mm thick) you will need to laminate additional material on the backside and then shape the rear of the headstock to match the contour of the headpiece. Thanks Romano that helps a lot! Fortunately I purchased a “log” of birdseye of abt 30 mm thick, so no need to laminate! Although I have finished shaping the neck, I left the “rough” headstock on, now I’m glad I did! Anyway, thanks for your quick response! How does one go about adjusting the intonation? In your picture, I see six philips head screws that look related, but I can’t see a way to move a saddle back and forth. hey folks, I am attempting to build a four string headless bass and i was wondering how i go about ordering some hardware for it. any help would be much appreciated! Calen â€” keep checking back. Within a month I’ll be unleashing a headless tuning system (also for bass) you might find worth waiting for. It will be easy to use, ergonomic, and premium quality.